This beautiful bear looks like he was just discovered in an attic.. Looking like he was just discovered in an attic or fresh from an auction, "Tramp" Teddy Bear is one of a kind. It takes a litle bit of magic to make a new Teddy Bear look like an antique, and the designers at Steiff have done just that! They created this special teddy to look like a vintage bear. "Tramp" is sewn from felted antique olive green mohair that was specially milled for a vintage look. He is softly stuffed with a patch sewn onto his paw pad to make him appear pre-loved. "Tramp" is 12.5-inches tall and is five-way jointed. 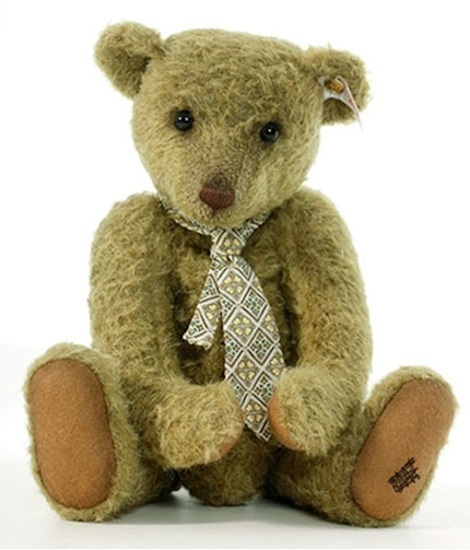 Everything about this beautiful bear says antique-from his airbrushed details to his faded cotton necktie. His elephant style button is also an echo of the past.